​The Multitrend paperless recorder reliably records electronic data in a secure format from directly connected sensors or transmitters that can be used for documentation of the process conditions and process improvement. Its large 12.1” diagonal high-resolution display provides the best solution for viewing process data from a distance, while the 48 analog input capabilities provide the means to monitor all critical and most secondary parameters in a given process. Users can customize the display of the Multitrend to gain an easy understanding of what is happening in the process. This also allows operators to make the best decisions regarding the actions required based on the data displayed. 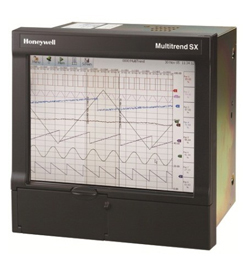 Its Ethernet feature, along with the TrendServer Pro software, provides plant-wide connectivity to the recorder.